Once considered garish and outdated, 1970's color schemes have become a popular choice for retro home design. This decade is known for its cheery but not excessively bright colors, which were used not just in flooring, carpeting and curtains, but also in appliance paint. While 1970's appliances came in a wide range of colors, several were more popular than the rest and are considered typical of the time. Green and orange were popular 1970's design colors. One of the best-known colors of the 1970s, harvest gold is a cheery, slightly muted shade of medium yellow. Many stoves, refrigerators, dishwashers and other appliances featured this shade. Harvest gold was often paired with dark browns, especially stained wood, creams and greens. Appliance trim tended to be black and stainless steel. Not really the color of an avocado, this shade of green more closely resembles olives. Kohler Design Center lists this color as "fresh green," in use between 1971 and 1979 on their appliances. This color's yellow tones mark a departure from bluer greens and teal shades of the late 1960s. Like harvest gold, avocado green was used on stoves, refrigerators, washing machines and other appliances as a main paint color. It was often paired with dark brown and stainless steel trim. Bright, warm orange tones appeared primarily in the early to mid 1970s and was originally popular during the 1960s. Kohler used this color on its appliances from 1974 to 1984 and called it "sunflower." This color was often paired with harvest gold and brown but was less frequently seen with greens or other cool colors. Orange was less common as a main color for appliances and is mostly seen in enameled cookware, mixers and accents. Only a few large appliances were painted orange, and these are relatively rare today. Warm browns were popular in the 1970s, usually on the darker end of the range. In most homes, dark-stained woodwork provided the brown tones, and appliances were usually painted in brighter shades. Often called "tobacco brown," "chocolate brown" or "Tudor brown," this color was also used in late 1960's decorating. Like orange appliances, brown appliances are less common than green or gold. By the end of the decade, appliance colors had begun to lighten and become less bright. Light neutrals, such as bone, ivory and almond, appeared on refrigerators, stoves, dishwashers and other major appliances. These colors went well with most décor and were used into the next decade. Kohler's "parchment" color was used on appliances from 1976 through the 1980s. 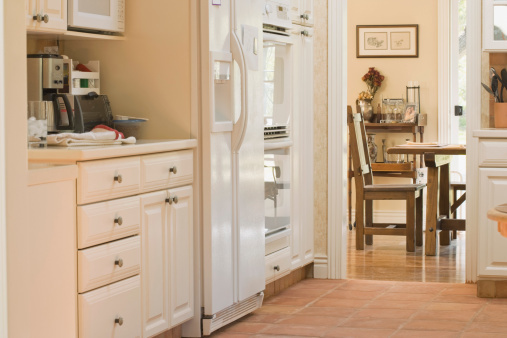 Light neutral appliances are readily available but are less iconic than the bolder tones.